Emily Grantwich lives quietly with her crippled father and eccentric aunt, managing the family's land, until the fateful day she walks down the main street of Melton Mowbray and is showered with Poudre de Violettes, thrown by a lady of loose morals at the handsomest man Emily has ever seen. He is Piers Verderan, known by many as the Dark Angel. His friends lay the blame for his scandalous ways on his troubled past. No decent woman should be seen in his company, but Emily must dutifully manage her father's estate-which Verderan's land adjoins. 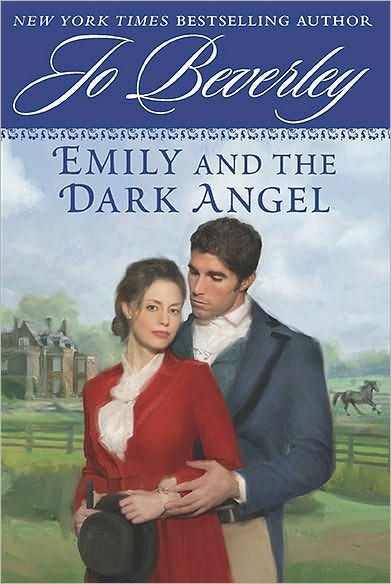 Another great Regency romance. I really fell for Piers Verderan in the last book and couldn't wait to see more from him. I immediately fell for Emily but over the course of the book, I really wanted to see a bit more fire from her. Her character progressed over the course of the story, but I was still left wanting more from her. On the other hand, I really loved Ver so much!